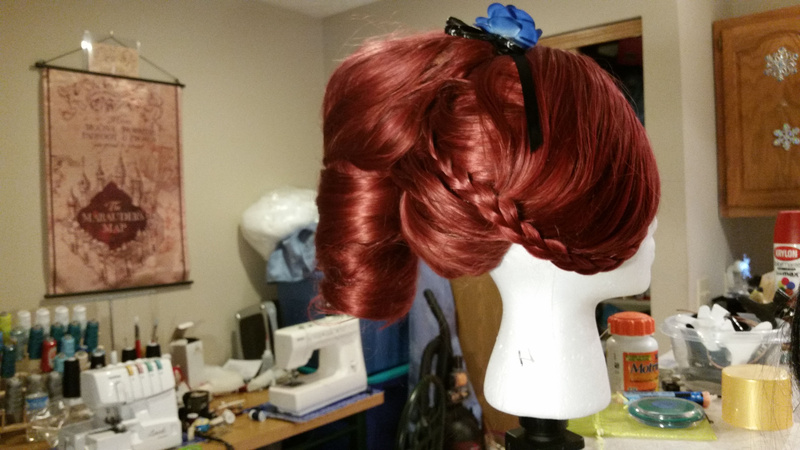 I don't even wanna talk about construction of this wig, it went so disastrously, haha! Patterns I used the same jacket pattern as I'd used for Nova, but with Niho's help to make the shoulders. We made a LOT of modifications to it. For some reason, I had three folders' worth of patterns from when I constructed this. Probably doubled it up for the applique? Hm. 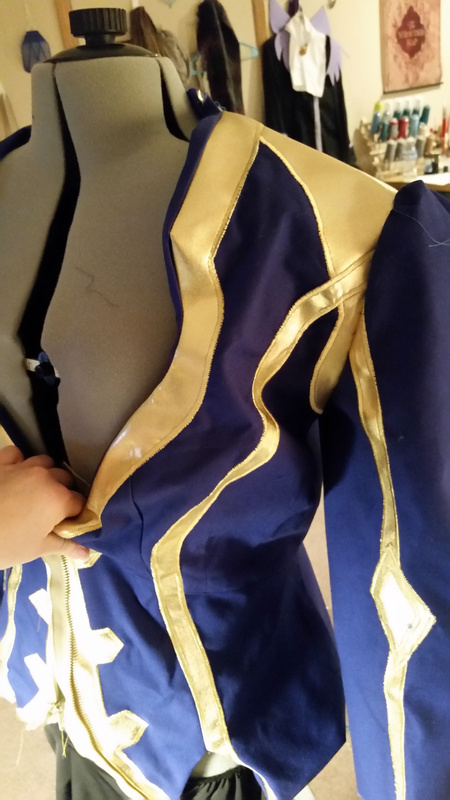 This costume straight-up broke my sewing machine, my soul, and my interest in Tales cosplay until Berseria was actually released. 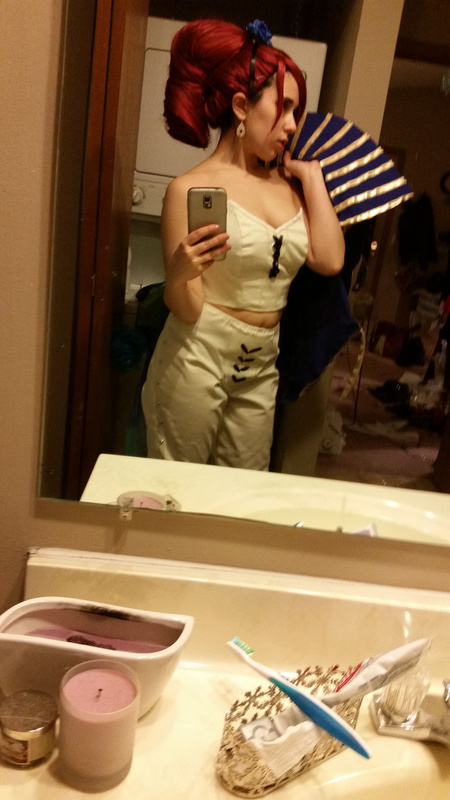 The fabric was itchy and ill fitting. 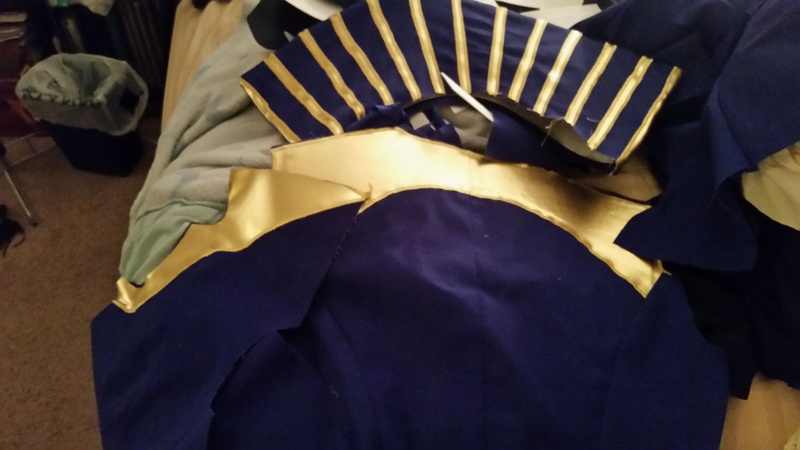 I didn't realize my machine didn't have a satin stitch width, so every applique line was thick. The armor hurt to wear and wasn't accurate or primed/sprayed well. The corset had no support whatsoever. The grommets didn't sit correctly. The wig didn't work out the way I wanted it to. Every single thing you could think would go wrong, did. I also didn't even sew the gloves myself because I didn't have enough time, so they were store-bought satin costume gloves. Forgive me my sins. I really liked the necklace and the hairpiece, and the way the chains hang from the coat. Niho's help with the collar was also a highlight. It was all in the fabric and the armor. 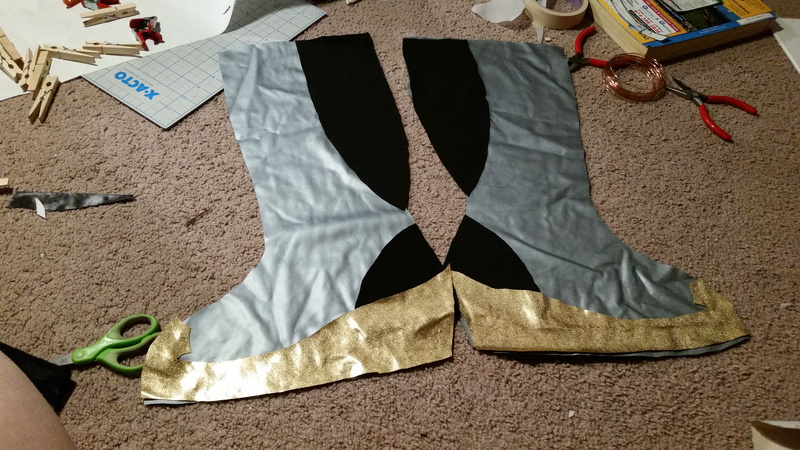 I had NO idea how to construct armor to be flexible, comfortable, or even close-able. So every attachment was painfully tightened by elastic and safety pins, which is not the way to go. I'd have definitely swatched and bought fabric online instead. But more than anything, I would have waited until the game came out before setting the plans, because I dislike the character so much that I'll never be comfortable wearing the costume again, even if I remake. Nope. But I've sold her to a loving home where she'll be appreciated, and that's what's the most important to me. Don't be me, cosplaying kids. I loved her design so much. It was said she was designed after a betta fish, and since I used to love those when I was a kid, I couldn't have been more excited to give it a shot. And then Zestiria was released. And I hated it in almost every possible way. Maltran's character was so incredibly shoved aside, so forgettable, so unimportant to what I wanted out of that game that I felt terrible following through with making her. I wore this outfit for a total of two hours. I'm really sad it turned out to have had so much money, time, and work put into it, and I hated wearing it. But my lesson has been learned! I'll never promise to cosplay a character I don't know enough about again. I'm waiting until the thing is released. And I'm going to be more selective about what materials and methods I use! Maltran was sold to a loving home in 2017.